Add our newest experience to your next party! Our new GLOW Wars experience includes our amazing GLOW Party upgrade, a glow necklace for each guest and the use of our new Glow Wars Moonball Blasters in Arena B! Kids and parents will have a blast as the Glow in the Dark balls soar through the air making everyone part of the party. As a special gift the Guest of Honor gets to take home their own Moonball Blaster! 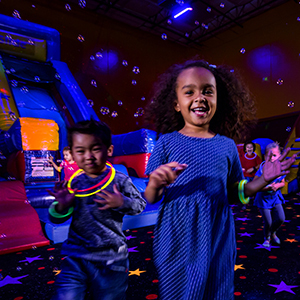 Our GLOW Wars Moonball Blaster experience can be added to any party at any time of the day! This experience is recommended for kids ages 6 & Up. Our GLOW experience now continues in the Party Rooms with our NEWEST Special FX lights! Includes one GLOW Necklace for each child and for the Guest of Honor-- the choice of an 18" LED Lumi-ton, LED eye glasses or LED ring. Our Glow Package is the perfect upgrade to any birthday party. 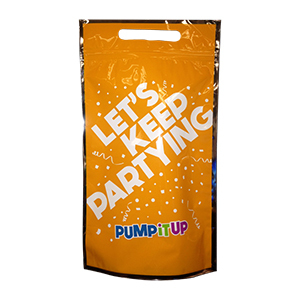 Even better, consider having a late night "pump-jama" party, a sweet sixteen party, graduation party or a Bar/Bat Mitzvah Celebration. Bring your IPOD and play your own sound track to customize your private party experience. Our Special FX lights are synced to our amazing concert quality sound system! 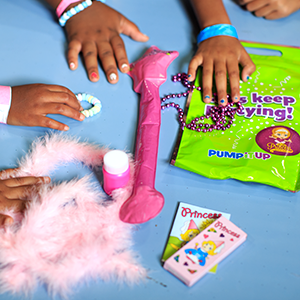 Make the kids glow with our assortment of personal glow and lighting accessories to enhance and brighten your "COSMIC" party experience. Suggested lights out party dress attire include white, neon, sport stripes, tie dye, glow in the dark clothing or face paint. Be creative. Use your imagination! This package can be added to any Party or Event anytime of the day. Make your party extra special by adding a visit from one of our newest staff members to your event! Character Visits starting at $35. Please call for details! *Please note that Character Visits do require a 21 day advance notice and Characters do normally visit during the arena time. Great for kids on the go! 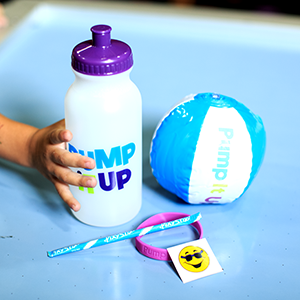 Our reusable water bottle, a Pump It Up mini beach ball, a pixie stick, a tattoo and a wrist band!